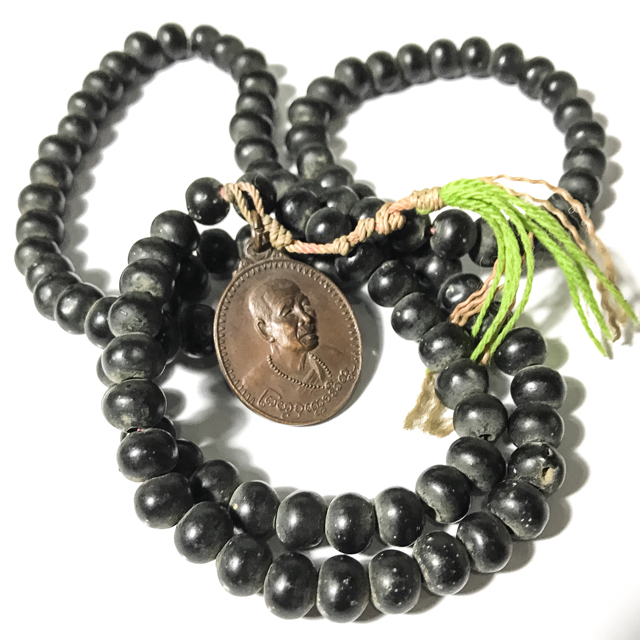 The Sacred Rosary is a traditional Buddhist instrument used for prayers and incantations, but Blesséd Rosaries are also empowered to bring protection, evasive instinct, lucky fortunes, promotion and status, mercy charm, and ward off all evil. This rosary is made from very old sacred ngiw wood, and is a standars lengh for wearing as a necklace, and for praying with as a counting tool to recite rounds of up to 108 prayers or incantations. The rosary has a 'Rian Kanajarn Guru Monk Coin from 2520 BE attached. It is a common and popular practice of Thai Buddhist Folk in the Northern Lanna Regions to have rosary with an amulet in the image the Kroo Ba Ajarn Guru who blessed the rosary. His parents were Farmers, but were not overly poor, and had enough resources to live without extreme hardships. Kroo Ba Prohmajak lived with Sila (precepts), helping to tend the farm, tilling the land, but refraining from hunting birds and animals. He and his family only farmed the fields, abstaining from breaking the first precept of not killing living beings. The also did not rear pigs, oxen, ducks or chickens to sell at market, abstaining from indirect killing. His parents were good Buddhists and would take the family to sleep at the temple on holy days, and chant prayers and give alms, and meditate. Kroo Ba Prohmajak passed away still seated in the meditation posture on the 17th August 2527 BE at 6:00 am at the age of 87 years old. His remains were kept for the devotees to pay respects for three years before he was given a state funeral ceremony and cremation on the 30th January 2531 BE, with HIs Majesty King Bhumiphol Adulyadej and her Majesty Somdej Pra Nang Jao Pra Boroma Rachininath came to inaugurate the ceremony and pay respects.